1. 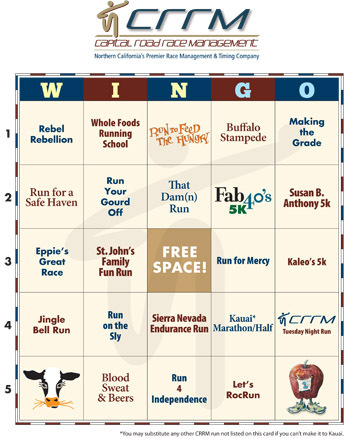 Plan your race schedule to fill out (get "WINGO") vertically, horizontally, diagonally, four corners or a "blackout." 3. Send in your completed card and win entry to Fair Oaks Sun Run or No Excuses for the reduced price of $10. Blackout wins free entry. See instructions for details.